Feel the need for more trail selfies? Instead of a heavy tripod, support your iPhone for 38g (1.3 ounces) or your small camera for 30g (1 ounce). This kit goes on top of regular bottles like the 1 liter sparkling water bottle that is always in my pack. There are two basic parts: a water bottle camera mount and a tripod adaptor for an iPhone (or other phone). If you have a lightweight camera, you can skip the phone mount and save 8 grams. Bottle cap mount: $10, 30g. This fits on the top of a regular small mouthed bottle. I carry a one liter sparkling water bottle (stronger than still water bottles), so I always have one of these. I wouldn’t support my DSLR with this, but it is fine for a light camera or phone camera. I got my bottle cap camera support from Photojojo. Glif: $20, 8g. This is how an iPhone is mounted on a tripod screw. The Glif Original is sized for a bare iPhone 4/4s or 5/5s, depending on the size you order. Mine is for an iPhone 4/4s, but fits my thinner 5s with the Apple leather case (see the photo above). If you have a different phone or want an adjustable mount, get the New Glif for $30. I don’t know how much the New Glif weighs, but I expect it isn’t much heavier than the Glif Original. Here is the New Glif (adjustable). The final touch is a camera app that has a self timer, unlike the built-in Apple camera app. I use Camera Plus, which costs a whopping $1.99 and adds more features than you probably need, though it does have that essential selfie feature, the self timer. How good is it? 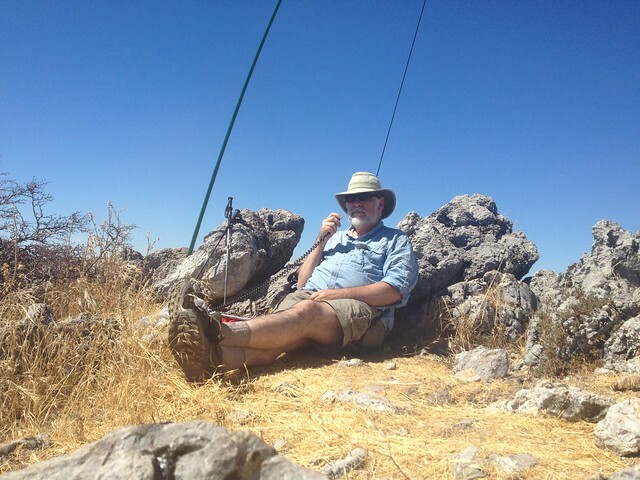 I took this selfie during a ham radio activation on Black Mountain. Looks good to me, good enough to put on my QSL card after I cropped it a bit. This entry was posted in Backpacking & Hiking, Photography. Bookmark the permalink. I could be your brother!… spitin image of me.. on Champlain Mt in Bar Harbor Me. My daughter giggled when I pulled out my radio!